Federal University, Ndufu-Alike, Ikwo FUNAI Has commenced the online sale of Post UTME Form For The 2018/2019 Academic Session, Thereby Inviting all eligible candidates to purchase the form online. We are using this medium to inform all candidates that wish to apply for admission into Federal University, Ndufu-Alike, Ikwo FUNAI that the screening form is now available, once you check the eligibility below and other details and you discover that you are qualified to purchase the form, kindly proceed to do so, as the online registration started on Friday 6th July and will close on Friday, 27th July 2018, any one who fail to register before the deadline will not participate in the screening exercise. The Management has set the cut off point for the 2018/2019 admission process to be 180 and above, so if you got up to 180 in the 2018 UTME and chose the institution as first choice you can purchase the form. 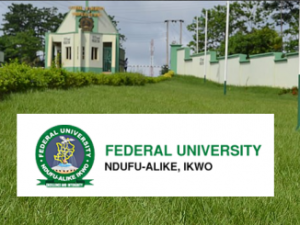 ALSO NOTE: All candidates who DID NOT choose Federal University, Ndufu-Alike, Ikwo FUNAI as their first choice in UTME But scored 180 and above and are interested to get admitted into the institution newly approved programmes, should kindly visit the school website funai.edu.ng and click on “New Programmes” for registration. You also need to do change of Institution in JAMB portal. 5. choose payment mode (Generate Remita Retrieval Reference Number). 6. Go to any bank with your Remita number for your payment. 7. Return to the Application page and fill in your JAMB Registration Number. 8. Then you continue with the completion of the form. 9. Upload CLEAR COPIES of 2018 UTME Result, O’ Level results, recent passport photograph, Birth Certificate, and Local Government Identification. 12. Print out your acknowledgement slip and bring along for Post UTME Screening. i. Once you are offered provisional admission, kindly and quickly accept the offer within two weeks or you will be considered to have forfeited the admission offer. So all Candidates who chose any of the above mentioned programmes need to change programmes as they may not be admitted into the above programmes in the 2018/2019 Session. The Post-UTME Screening Test for the programmes listed below has been scheduled to start from Wednesday, 8th August, 2018 to Tuesday, 21st August, 2018. ALL CANDIDATES SHOULD TAKE NOTE: The management announced that the VENUE for the screening tests will be at the University’s Computer Based Test (CBT) Centre, take-off site while the acknowledgement slip printed from the portal contains DATE and TIME of test for registered candidates. Please Click On The Facebook Button And Share.